In a previous post we introduced some comparisons of aircraft by its price per kilogram. There, we could see a trend in bigger aircraft being cheaper in this per kg basis. This raises the question: do bigger aircraft require less weight per seat? Are they lighter in a kg per seat basis? 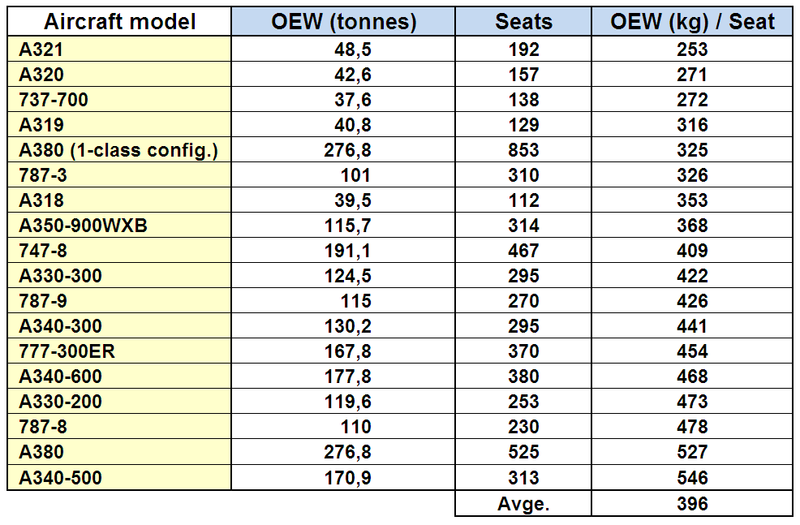 Aircraft OEW (kg) per seat. Our intuition wasn’t very successful again. 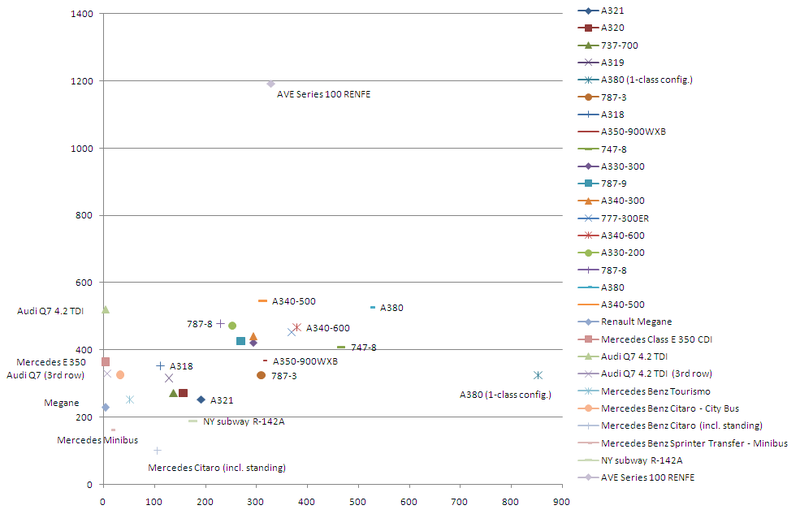 In the upper part of the table we find the A320 family and 737s aircraft (those used by e.g. Easyjet and Ryanair in short-haul routes). In the bottom of the list we find the A380, A340, A330, 787, 777…, the biggest aircraft. Cars empty weight (kg) per seat. It turns out that cars also need around 300-500 kg of structure per seat (an average for these ones of 360 kg). Since most cars carry 5 passengers, here it’s easy to see the trend: bigger cars employ more kilograms per seat. Small for small: take the A321 with 253 kg/seat, it is quite similar to the Renault Megane with 230 kg/seat. Large for large: take the A380 with 527 kg/seat, it is almost identical to the Audi Q7 with 527 kg/seat. Buses empty weight (kg) per passenger. When we compare the figures of touring and city buses in an all-seated configuration we get again similar figures than planes and cars (~290 kg/seat ~ A320 family). If we take a fully loaded city bus we descend to the crude reality of mass transportation and complete lack of comfort (100 kg/seat; that is cattle-class…). 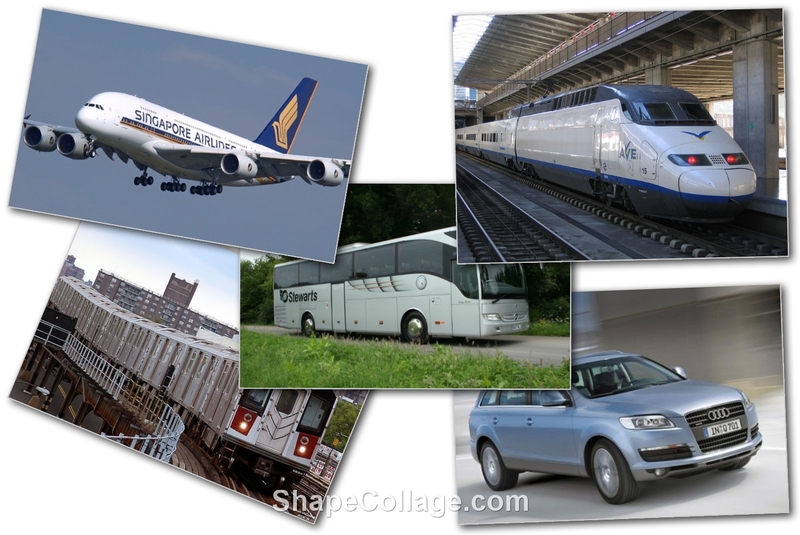 We may notice as well that a minibus weighs less than a Q7 and carries twice or three times as many people. Subway and high-speed train weight (kg) per passenger. The subway is below the levels of aircraft, but not that low as city buses. As far as the train is concerned: that’s another story, a luxurious experience (achieved with ~1,200 kg/seat) that can only be improved by Singapore Airlines Suites. Below we can see again a graphic with all modes of transportation compared, there we may spot some trends. Modes of transportation weight (kg) per passenger/seat. We could say that comfort starts above 300 kg/seat… How heavy is your car?